"We went to Cy Laurie’s, a home of ‘Trad’. Down steep stairs to a room lighted only near the band and in the corners we found a hundred or so youngsters, average age about 20. Most of them were in the midst of a hectic jive session. Some were glued to the walls in gloomy concentration on the music. Some members come three or four times a week and being in the swim is manifested by a sort of nightmare uniform. Long straight hair for the girls, black or scarlet stockings, fisherman’s knit sweaters reaching to the knees or long tube dresses. Little beards were common and a lot of the men had tight-cut trousers with a distinctive stripe. I was told that the thing of the moment, exclusive to this club, was the turning round of clerical collars. I got nowhere in my efforts to find out their jobs. They just did not admit to working although some were obviously bona fide students. Three bands played while we there. No single one could possibly maintain the pace throughout the whole evening. There was almost no pause between numbers and the music was ear-splitting. There was less of a social club atmosphere here… Again and again I was told ‘it depends what band is playing. We follow the band’. Such is their devotion that they come from as far away as Nottingham and Bournemouth. A little older than the Trad fans down the road they also seemed more steadily employed – shipping clerk, apprentice printer, builder, shop assistant, music student. The list was endlessly varied. ...And never forget that they are not licensed for drinks, and the two we saw were absolutely rigid about the ‘Members Only’ rule… nowhere did we find anything stronger to drink that a ‘coke’. See also London Jazz Clubs 1950s. 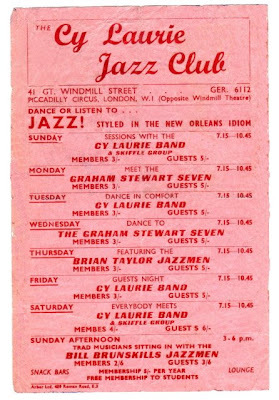 Thanks to Steve Fletcher for sending in this clipping - he is actually in the photo on the left - and for this flyer from the Cy Laurie Jazz Club at 41 Great Windmill Street in Soho. Note the invitation to 'Dance or listen to Jazz! Styled in the New Orleans idiom'. The club was indeed open every night of the week with bands including Bill Brunskills Jazzmen, the Graham Stewart Seven, the Brian Taylor Jazzmen and of course the Cy Laurie Band - sometimes with a skiffle group - skiffle also emerged from this scene. Memories, flyers and clippings from this scene or any other always welcome - email address is in right hand box. Nice find! That well predates the OED's earliest citation of 'mod' in this sense (New Left Review, 1960).